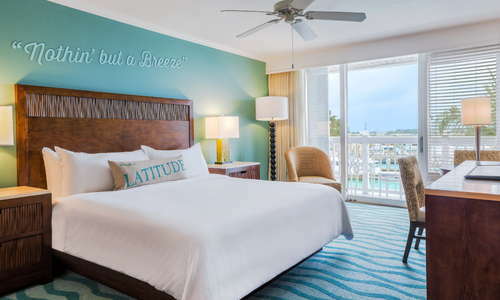 The vibe isn’t "grapefruit and juicy fruit" yet at this former Westin-turned-Margaritaville, but the brand has well begun its takeover of the rooms and public spaces. In time, the vibrancy and fun will be everywhere. In the meantime, you’re still in the best location--and that won’t ever change. 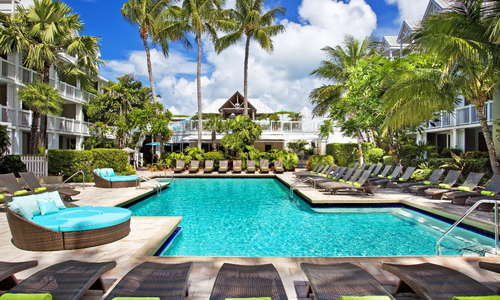 YOU SHOULD KNOW There’s a $29 a day resort fee, and if you want to visit the beach at their ultra-inclusive sister resort, Sunset Key, it’s $20 a day per person. Parrot Heads (Buffet fans) will love the lyrics on the walls and throw pillows. 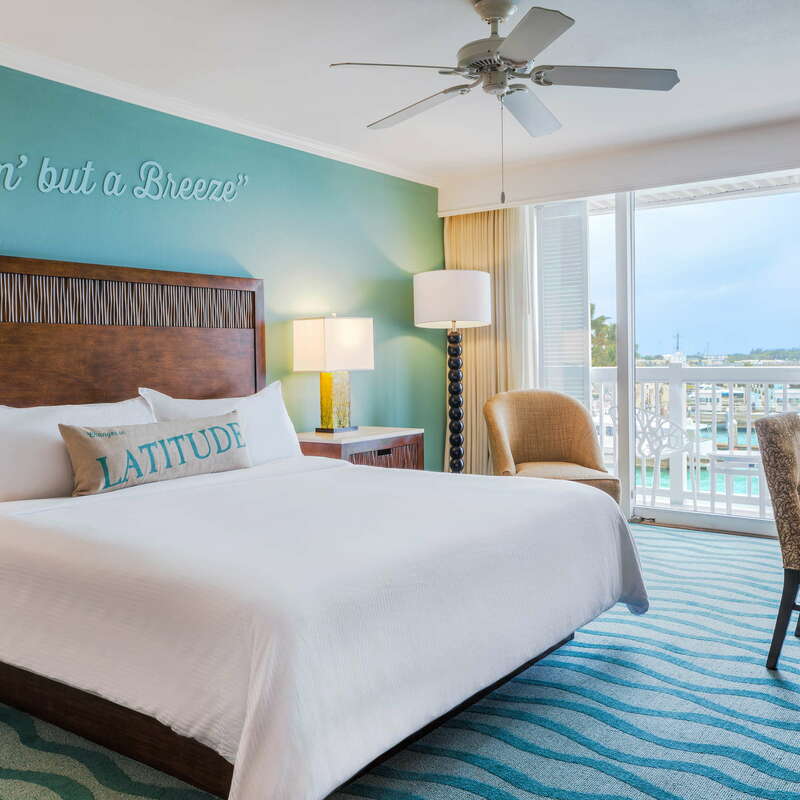 Soothing rooms have new tropical art, colorful carpeting, modern wood furniture, and premium bedding (which is ultra comfy). You’ll also get a Keurig with K-cups, bottled water, mini fridge, bathrobes and slippers, an umbrella, and fun laundry bags. The large flat screen is awesome but Wi-Fi is slow. Ask for a balcony room and expand your space. Suites are huge with a full size fridge. YOU SHOULD KNOW Since this resort is next to the cruise port, some oceanfront rooms may have a blocked view during the day while the ships are in port. Well designed with a backlit mirror, glass enclosed shower, marble floors, lighted makeup mirror, glass bathroom scale, lots of fluffy towels, a large rain-style shower head, and all the high-end bath products you’d ever want. The shower and toilet are separated from the sink area by a thick door with frosted panels. YOU SHOULD KNOW The panel-frosted door doesn’t quite go all the way to the floor so although you think you’re enjoying lots of privacy, you’re not. A mural with Buffet lyrics adorns the wall behind the check-in counters and sail-style ceiling fans spin on high. Colors of the sand and sea prevail and the seating areas are adequate with rattan furniture and bowls of sea stars. Surfboards stand tall by the entry doors. 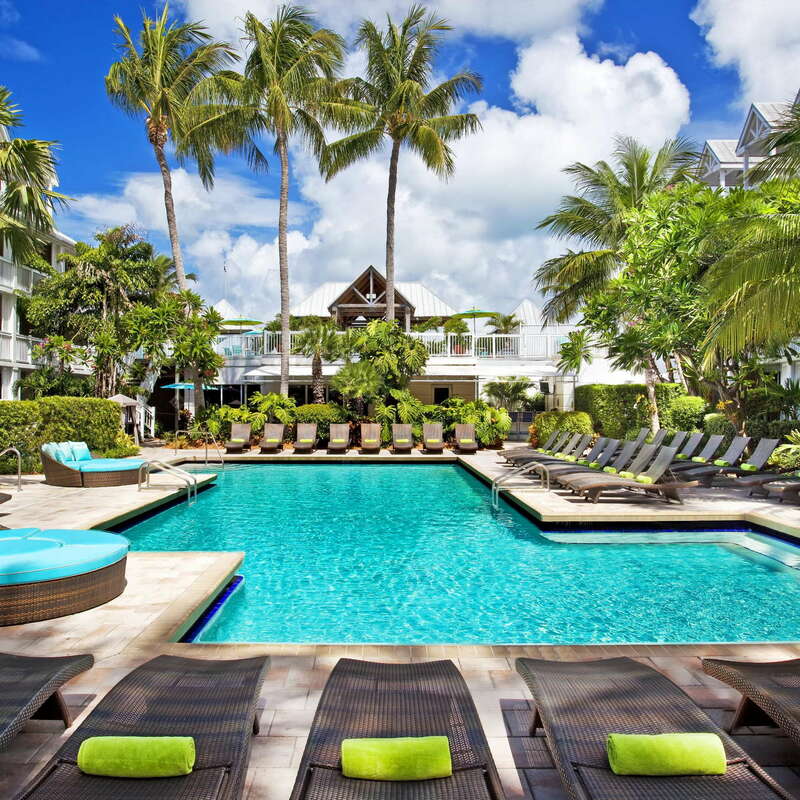 The pool is smaller than you’d expect at a resort of this size, but there are plenty of luxurious loungers and nice pool towels at the ready. Palms trees and the hotel’s pool view rooms surround the space. No sign of Margaritaville here, though. Don’t miss the fruit kabobs, popsicles, and chilled towels poolside. Pool staff will even polish your sunglasses. 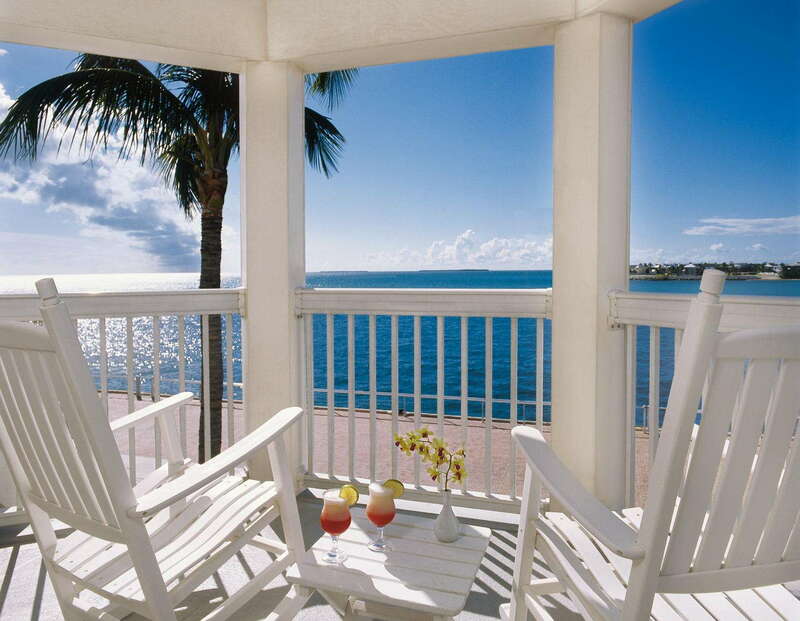 Take a 7-minute boat ride to their sister resort, Sunset Key Cottages, for the ultimate in spa pampering. It’s on the small side, but it’s relaxing and lovely. Onsite, you can get a massage treatment in a private room in the Fitness Studio. Modern and bright, their Fitness Studio is on the ground level and offers a good assortment of equipment and machines, 24/7. Use your key card for entry. Chilled towels are available. 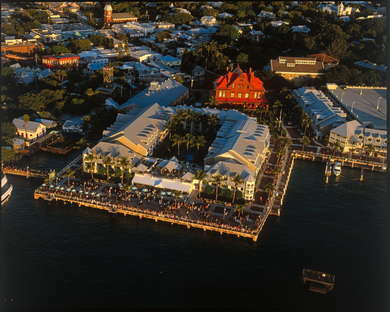 Their signature restaurant is Bistro 245 overlooking the Key West Harbor. 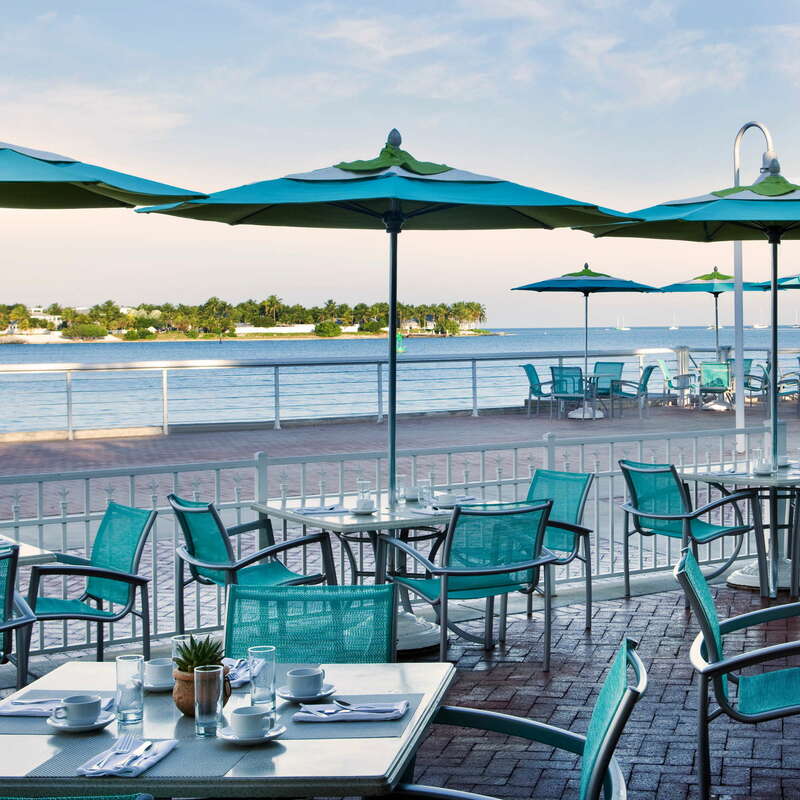 Dine in or out for all three meals and enjoy the water views. Poolside is where you’ll find Castaways, with salads, sandwiches, and light seafood options on the menu. Have a drink at Bistro 245, poolside at Castaways, and upstairs at the Sunset Deck (open 6 p.m. to 10 p.m.). 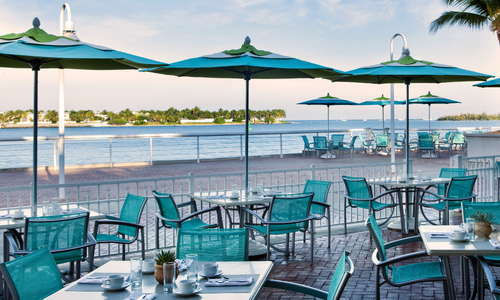 Try something new and take the boat shuttle to Sunset Key and have a cocktail at the outdoor bar at Latitudes. 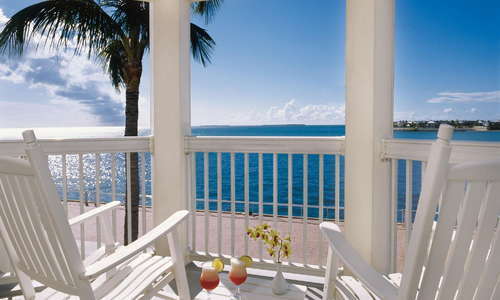 Catch the sunset celebration nightly at one of their private spaces, The Pier or the Sunset Deck. 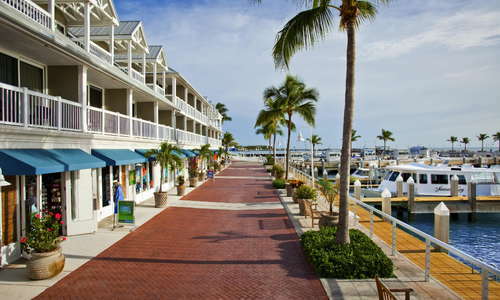 You’ll also find lots of shops and a marina right outside. Want to go snorkeling, parasailing, diving, or fishing? 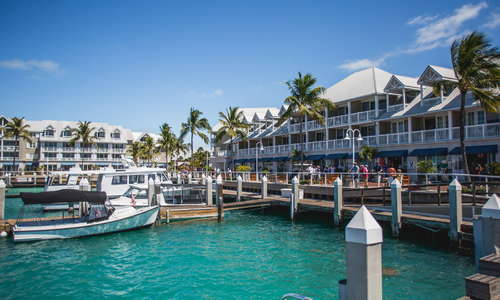 The concierge can arrange everything for you and you can leave right from the marina. Driving around Key West is highly discouraged because parking can cause major headaches. This town was meant for walking. Of course, you can also take a taxi, bicycle, or pedicab. Scooters are for rent everywhere but you have to watch out for cars that are not watching out for you. 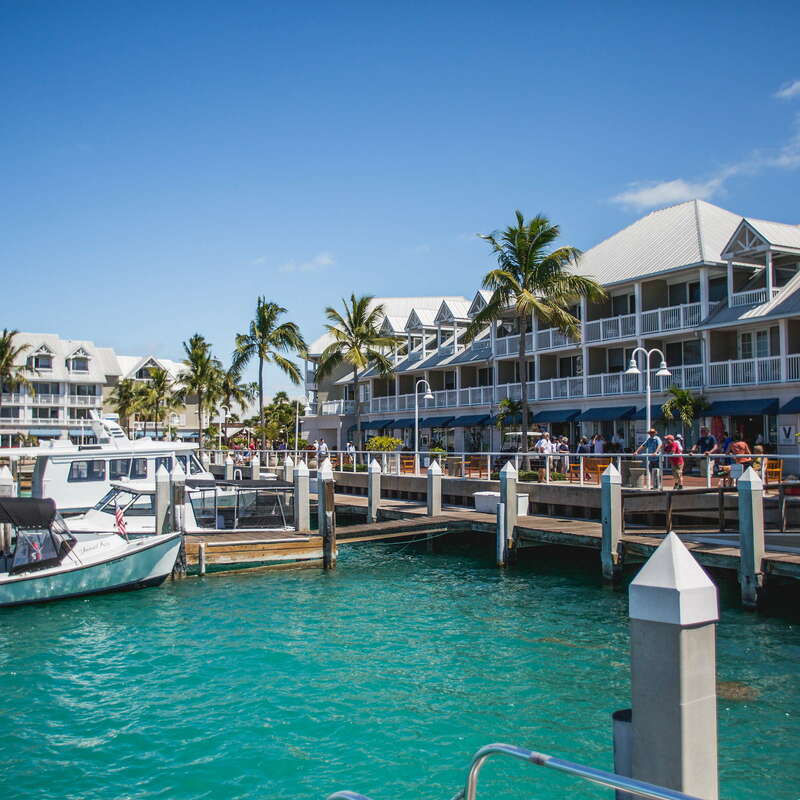 Latitudes (7-minute boat ride) is a shuttle away on Sunset Key and is the most romantic spot in Key West. Blue Heaven (13-minute walk) is famous for its Floribbean cuisine, its roosters, and its key lime pie. Santiago’s Bodega (14-minute walk) is one of the best restaurant on the island, serving tapas on small plates and fabulous sangria. Hog’s Breath (1-minute drive) is known for its live music and good drinks, and you never know who’ll show up to sing on stage. Visit the bar where Hemingway hung out and get a souvenir t-shirt at Sloppy Joe’s (3-minute walk). Don’t miss Captain Tony’s Saloon (2-minute walk). It’s another Hemingway hangout and the bras hanging from the ceiling and tree growing through the roof are rather legendary. 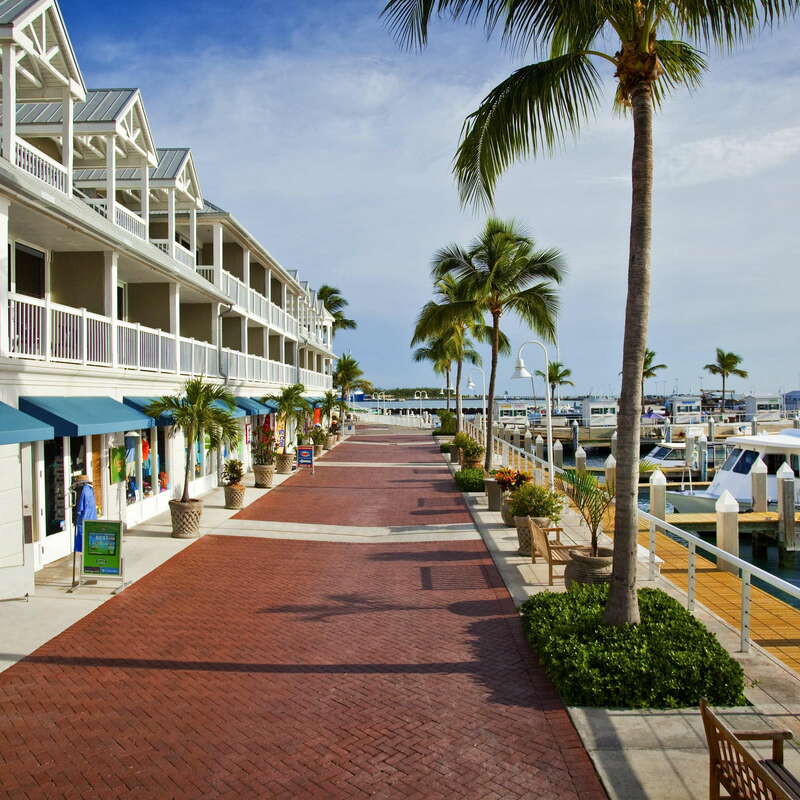 What’s not to love when you can stroll right out the door and be in the center of the Key West universe? Popular bars, shops, restaurants, museums, and nightlife are all within walking distance--a very short walking distance. You can also escape the craziness by hanging out at the pool, enjoying a front row seat to the sunset from their private spaces, or watching the world buzz by from your balcony. 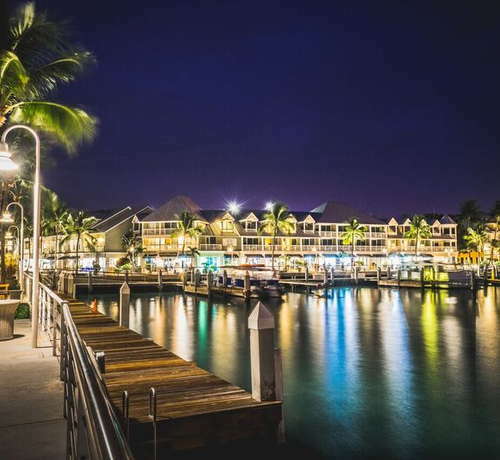 And with privileges to Sunset Key, that world is your oyster.